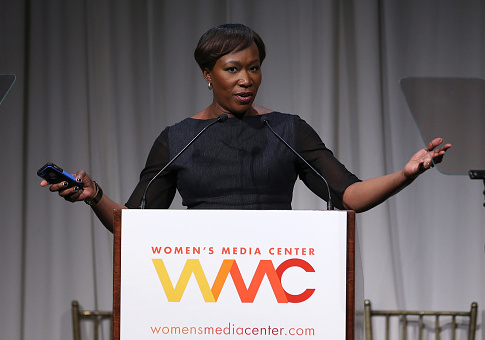 In a series of 2006 blog posts attributed to MSNBC host Joy Reid, the liberal pundit linked to Islamophobic blogs and called Islam in its current form "largely incompatible" with Western democracy. After Reid apologized for old homophobic blog posts in December 2017, her blog The Reid Report was effectively taken off of Internet Archive's Wayback Machine thanks to an exclusion request added by the website's operators. But a mirror of the Wayback Machine operated by the Library of Congress remained unaffected, and several of Reid's post are still visible on that site. In February 2006, much of the Muslim world broke out into violent protest over Danish paper Jyllands-Posten‘s publication of several cartoons of the prophet Muhammad. Reid weighed in on the matter in a Feb. 2 blog post, titled "Clash of civilizations, take 15,342," that framed the violence as an indictment of George W. Bush's neoconservative quest to bring democracy to the Islamic world. In the post, Reid linked to notorious conspiracy and birther site Gateway Pundit and scoffed when an American Muslim group called the controversy a "learning experience." "Uh … ok… I'm not sure what we're learning here, except that the current iterations of Islam are largely incompatible with Western notions of free speech and expression, and thus, I'd say, with the Bushian dream of Western style democracy for all," she wrote. 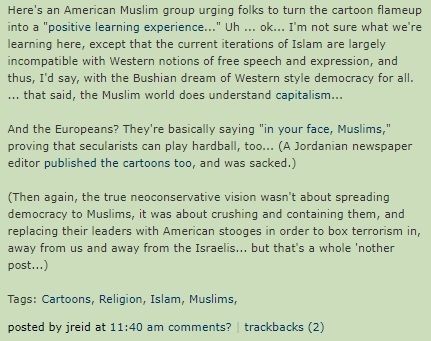 In another post, Reid took aim at the Westerners who were still defending the cartoons, calling it naive to expect Muslims to embrace freedom of speech. "You guys wanna demand that the world's billions of Muslims get with the ‘classical liberalism' program? Good luck. That tactic has really worked out for the Scandinavians, the British and the French," Reid wrote, linking to stories of riots and terrorism in those countries. Reid cites what she calls "a salient point" she found on a blog called Mark in Mexico that referred to Muslims firing guns in "garbage and sewage laden streets outside of their mud huts" and promised Muslims would wage a world war if they had the resources. 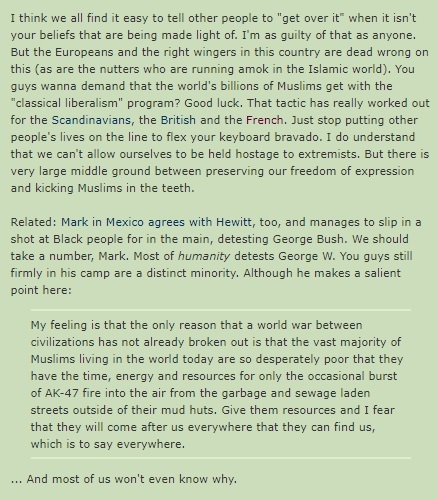 My feeling is that the only reason that a world war between civilizations has not already broken out is that the vast majority of Muslims living in the world today are so desperately poor that they have the time, energy and resources for only the occasional burst of AK-47 fire into the air from the garbage and sewage laden streets outside of their mud huts. Give them resources and I fear that they will come after us everywhere that they can find us, which is to say everywhere. In response to the most recent controversy over old blog posts, Reid and her lawyer insist that at least some of the posts on her old site were actually placed there by a hacker. The Library of Congress archived Reid's site on Feb. 7, 2006, meaning the hacker would have had to strike over a decade ago.